The exhibition will kick off with a Public Grand Opening Reception on Friday, May 3rd from 4-7 pm. The event will feature gourmet hors d’oeuvres, live entertainment, cash bar, “meet the artist” opportunities, voting and presentation of People’s Choice Award winners. Designed as a showcase for the area’s top creative talent, the non-juried exhibit will be on display May 3rd – June 2nd in the Salida SteamPlant Annex. All entries will be for sale, with 80% of proceeds going to the artist and 20% to benefit the SteamPlant. Patrons attending the reception will vote for their People’s Choice favorites; and winners will receive cash and/or merchandise prizes in addition to Award Certificates. The show and winners will be heavily publicized throughout the Rocky Mountain region; and many entries traditionally sell at the grand opening reception and throughout the show’s duration. 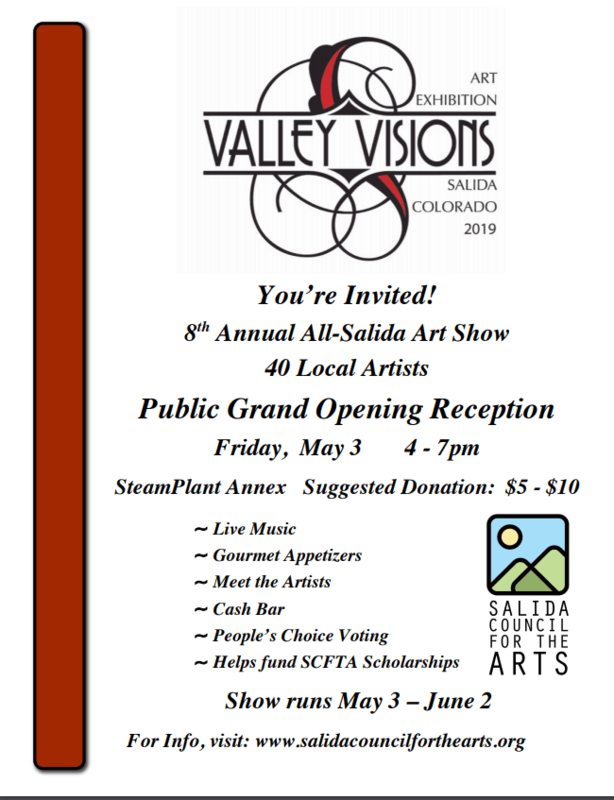 Valley Visions is sponsored by the Salida Council for the Arts and welcomes additional sponsors for this festive event. Click here to sponsor this event.